Pet Wants’ carefully developed proprietary pet food is slow-cooked with fresh, all-natural ingredients and delivered locally for free. Annemarie Gaebel with her daughter Jordan and dogs Buddy and Bella. I am here because I love animals and I want to work with you to make their lives better through great nutrition. 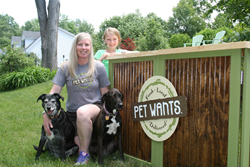 Annemarie Gaebel is proud to announce the launch of her new all-natural, delivery pet food business, Pet Wants of Littleton. Pet Wants’ carefully developed proprietary pet food is slow-cooked with fresh, all-natural ingredients. The company’s distributor makes the dog and cat food in small batches once per month so every kibble is guaranteed to be fresh and packed with nutrition. Pet Wants of Littleton is a franchise of the Pet Wants Franchising Systems and the mobile service delivers to Littleton, Acton, Chelmsford, Groton, Lincoln, Lowell, Westford, Stow, Sudbury, Harvard and the surrounding areas. “I’m a school teacher and I enjoy it, but I was looking for something that I could really be passionate about. I truly enjoy hanging out with my four-legged friends and, when I learned about Pet Wants, I knew it was the right fit. Pet Wants gives me the opportunity to work with animals and help pets throughout the region to live healthier, happier lives,” Gaebel said. “When I learned about what’s in other pet food – and how long some of it has been sitting on the shelves at the store – I felt bad for giving it to my pets. Pet Wants’ food is all-natural, fresh and high-quality. Plus, if you have any questions or concerns, there’s a real person behind Pet Wants of Littleton. I am here because I love animals and I want to work with you to make their lives better through great nutrition,” Gaebel said. Gaebel lives in Littleton with her husband Steve, daughter Jordan, dogs Buddy and Bella, and cats Maggie and Carmella. In addition to her work as a teacher – and now a business owner – Gaebel volunteers for the New England Disabled Sports organization teaching adults and children with disabilities to ski and snowboard. To order Pet Wants food for your favorite companion or to learn about the company, call (617)315-4711, email AGaebel(at)PetWants(dot)com or visit http://www.PetWantsLittleton.com.